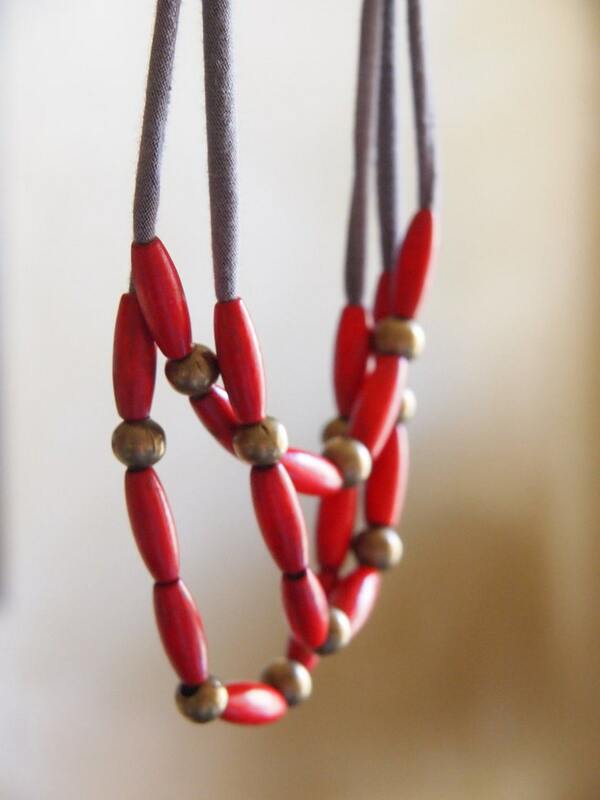 18 red wooden tube beads (roughly 1") and 11 antique bronze-brass round beads strung onto three strips of gray cotton jersey. This is my fourth necklace. I love them all. Love this necklace. It’s my third from Simplylivly and my favorite. Cute necklace!! Quick shipping too!! All sales are final. If by any reason you are unsatisfied with the necklace you purchased, contact us and we will work with you to resolve the issue. All necklaces are shipped with a tracking number. If an item is lost In the mail we are not responsible for it therefore we are unable to refund you for the loss. If your necklace arrives damaged, please send me a photo and I will issue a replacement (if it's still in stock - many items are one-of-a-kind).